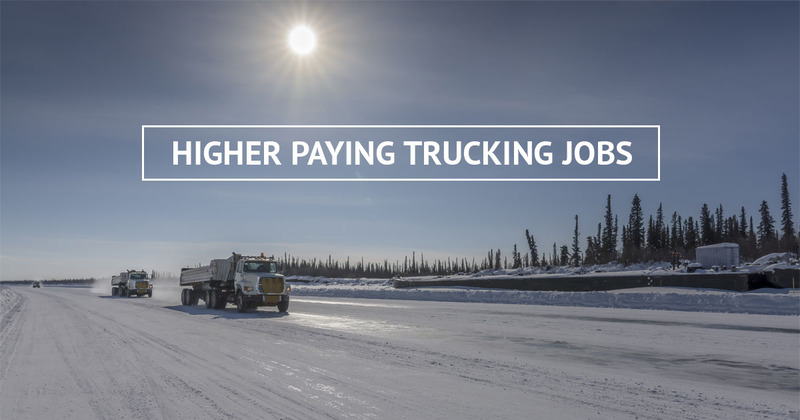 Higher Paying Truck Driving Jobs - Do You Qualify? The median trucking salary nationwide is $40,000, and the average salary remains over $70,000—with a fair number of drivers making over six figures. So how can a trucker find higher paying truck driving jobs? Ice Road Drivers—it’s challenging enough driving a standard vehicle in extreme weather, which is why Arctic and icy weather drivers make more. As much as a full year’s salary in a 4-month window. Sounds great, but make sure you are qualified and prepared. For example, due to the remote destinations, mechanical skills are often required to reduce the risk of driver fatalities, late deliveries and the cost of retrieving a disabled truck. Just be prepared for temperatures to drop to a frigid -50F or colder. Mine Dump Truck Drivers—there is a lot of on-site downtime in this job as drivers wait for their load to be filled. Where the specialized skill comes in to play, is learning to drive your heavy truck in a manner that doesn’t disturb the mine. Disruptive driving could create unsafe conditions by disturbing the surrounding walls, increasing the likelihood of falling debris or collapse. Overseas Trucking—some overseas trucking positions available to US truckers come with a base salary and a type of hazard pay which can reach over $250,000 per year. While a specialized driving skill may not be required, there is also an increased risk for security, safety, and hijacking. Treacherous mountain roads, cultural differences, language barriers and personal safety are just some of the concerns. Do your homework. Oversized Loads—driving oversized loads requires an advanced understanding of weight, balance, and navigation. Some companies will offer specific training and pay qualified truck drivers a premium. Depending on the type of load, you may work with a spotter or even become the center of attention when intersections are closed or lanes blocked to give you the right-of-way. Hazardous Loads—driving a hazardous load requires you to comply with more stringent rules and regulations; many of which vary from state-to-state. Your driving skills must also be superior, as an accident or collision can prove life-threatening well-beyond the roadway. Hazardous waste spills could impact a community by contaminating drinking water, or cause an explosion or fire. Transitioning from Local to Long-Distance—if you currently drive a local route, start looking at job openings for longer-distance routes. This will require more time away from home, but the pay is often higher. Talk with your family and have a plan to keep the family dynamic strong. Long Haul Over the Road (OTR)—If you’re ok with changing schedules and routes than long haul could be your thing. OTR drivers are typically on the road 300 days per year. This lifestyle is not for everyone, and neither is the routing and timeline which requires you to crisscross back and forth across the country. However, you will likely make upwards of $100,000. There is a trucking shortage of almost 50,000 drivers nationwide. This means that many trucking companies are willing to pay more for quality drivers. Watch for job openings and keep an open mind to relocating and additional training. Now is the time to find higher paying truck driving jobs. Buy Commercial Tires Online from Hunter Tires. Tread with Strength. Trucking Tips Categories Select Category Commercial Tire Maintenance Commercial Tires Finances FMCSA Regulations The Trucking Life Truck Driving Jobs Truck Repair Trucking Business Trucking Industry Trucking Safety Veteran Owned. Veteran Proud. We’re confident and committed to the quality of our tires and our customer service. We have 4 types of warranties available on Hunter Tires to guarantee your purchase.